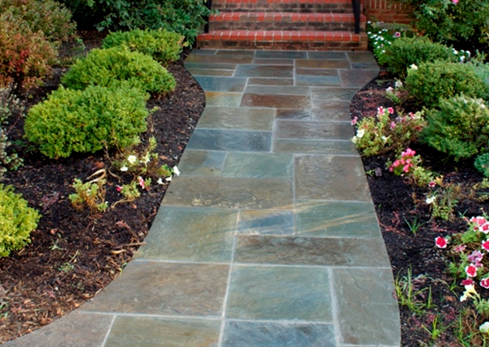 O’Grady’s Landscape designs and installs custom walkways and pathways for residential landscapes in Northern Virginia, specializing in stone walkways. Our walkway designs are created to add direction and improve functionality of both front and backyard living spaces and are carefully crafted on a project-by-project basis. Our goal is to help you enhance the aesthetic with charming yet practical pathways that will guide your guests around your landscape design in style. Request your initial consultation to get started today or call 703-533-5001 to speak with us about your walkway project! Flagstone walkways are a popular choice for homeowners in Northern Virginia for their appealing look, durability, and low-maintenance qualities. Stones are available in various shapes, sizes, and colors and your walkway design can be either structured or in a random, irregular pattern. Paver walkways are also available in a wide variety of shapes, sizes, and colors and are known to be durable and weather resistant. They are also easy to repair. 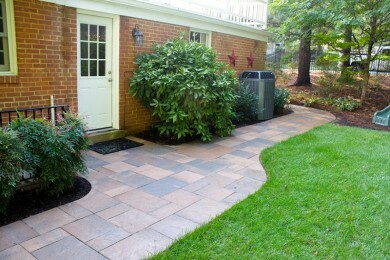 Material options include concrete, brick, and natural stone pavers. 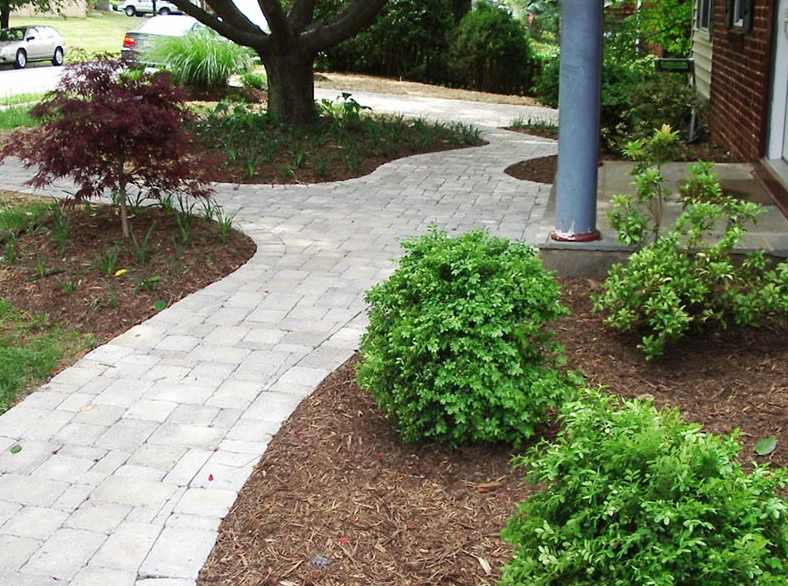 Pathways can often offer a more natural, warmer look than structured walkways. Built with boulders or larger stones, pathways are often designed to wrap around a garden or koi pond. Stones can be stacked on top of each other to accomplish more of an aesthetic goal or placed side-by-side, like steppers leading from one part of your landscape to another. Both techniques are used in the pathways pictured below from projects we’ve completed in the region. 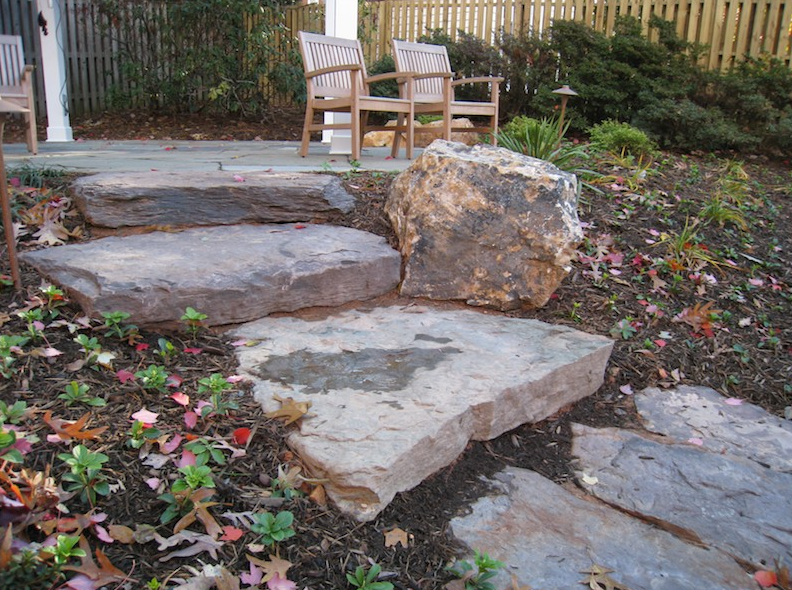 At O’Grady’s Landscape, we specialize in hardscape design services for homes in the Northern Virginia area. Our custom pathways and walkways are known to withstand heavy traffic and snowy weather without compromising on beauty to achieve this level of functionality. We can help you build a walkway and patio to match, or we can create a stand-alone walkway design to add charm and practicality to your garden design or front yard landscape. Whether you want to create an inviting front yard entry with a paver walkway or you want to build a stone pathway across a koi pond in the backyard, we can help you accomplish nearly any goal. So if you’re interested in pathways for a home in Great Falls, the City of Falls Church, McLean, Vienna, or North Arlington, let the experts install it right. Call to request your consultation today—703-533-5001!